Before I start, I will love to say that in as much as I am the one blogging, this topic happens to also be a great inspiration for me. 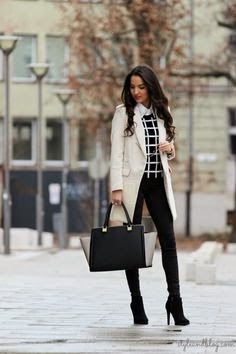 I am also going to get inspired from combining your outfit so well just with black and white. This is because I am not a huge fan of white and because I am crazy about combining colours or popping your outfit with a bright colour (You can find more on making a huge difference with a pop of colour here >>> chidinmainspirations.blogspot.com/2014/07/making-big-difference-with-pop-of-colour.html?spref=tw … in case you missed it). So, this topic will be an inspiration for people including me that one can actually look like royalty just by combining your black and white outfit well. - Part 3- Home designs i.e. designing your home with just black and white colours and still leaving your home looking like a royals home. Tuesday, will be for men and homes... all black and white inspiration. Below are pictures of ladies, all on black and white and they all look classy, beautiful, chic, sophisticated and above all, like royalty. Enjoy! I hope you have been inspired? I sure have. I love hearing from you, so please do feel free to share your thoughts, suggestions or contributions with me by commenting below.